When this issue of Canadian Teacher Magazine was in the planning stages, we took some time to sort through the new books that had been sent to us for review. We quickly realized that we had acquired quite a selection of hockey books at various reading levels. January, in a Winter Olympics year, seemed like the ideal time to review them. Knowing that the news media would be full of domestic and Olympic hockey news for quite some time, I got to thinking about what a great opportunity this would provide teachers to support their students in developing their reading skills! Making Connections, Asking Questions, Visualizing, Inferring, Transforming, Predicting—all these reading strategies could be practised as the students kept up with the hockey news. hock-ey: (hok’i), n. [prob.< O Fr. hoquet, bent stick], 1. a team game played on ice skates, with curved sticks and a rubber disk (puck). Well, that sounded simple enough. Then I turned to Wikipedia. I watched in amazement as twenty-four pages of information spewed forth from my printer! Who knew that “The first organized game was played on March 3, 1875, in Montreal, Canada”? or, that “The Dominion Hockey Challenge Cup (which later became known as the Stanley Cup) was first awarded in 1893 to the Montreal Hockey Club”? A search at my local bookstore proved it to be an even more prolific source of information. Hockey books of every imaginable type occupied shelf after shelf in the sports section. By now I had collected so much information that the intent of the article was in danger of slipping out of focus. So, I decided to simplify. Could there be any better way to describe the passion that Canadians feel for their winter sport than to read Roch Carrier’s iconic story, The Hockey Sweater? 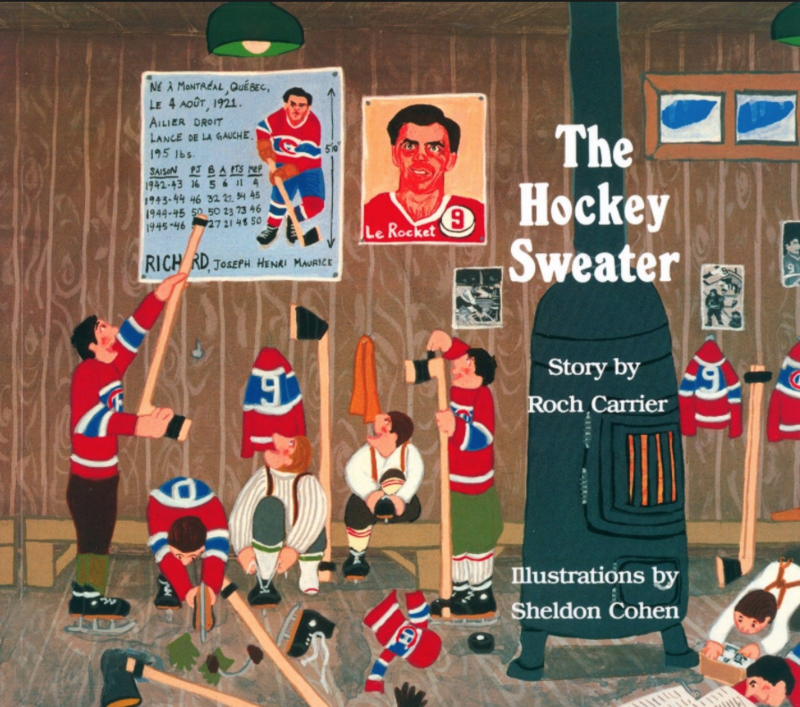 The story of The Hockey Sweater is based on some of the real-life experiences of Roch Carrier as he was growing up in Sainte-Justine, Quebec during the 1940s. The winters of my childhood were long, long seasons. We lived in three places— the school, the church and the skating-rink—but our real life was on the skating-rink. At that time Roch and his friends were obsessed with the Montreal Canadiens. We all wore the same uniform as Maurice Richard, the red, white and blue uniform of the Montreal Canadiens, the best hockey team in the world. One winter Roch’s mother noticed that he had outgrown his Montreal Canadiens sweater. She ordered him a new one from the Eaton’s catalogue. As the order forms were printed in English, which she could not read, she wrote a letter requesting the new sweater in French. To Roch’s horror, the sweater that arrived was the blue and white sweater of the Toronto Maple Leafs. Roch cried and protested but his mother insisted that he wear the new sweater. When Roch arrived at the skating rink in his blue and white sweater his friends stared at him. The coach removed him from his usual position on the team and put him on the second line. Even when one of the defensemen was injured, Roch was not allowed to play. I crashed my stick against the ice so hard that it broke. The referee told Rock to take off his skates and to go to the church to pray for forgiveness for losing his temper. Wearing my Maple Leafs sweater I went to the church, where I prayed to God. I asked God to send me right away, a hundred million moths that would eat up my Toronto Maple Leafs sweater. Here is a lesson to teach questioning as a reading comprehension strategy using The Hockey Sweater. Divide the book into three logical chunks. Mark the end of each chunk with a sticky note. Check to see that the students understand what questioning is (it is when the reader wonders about the story before, during and after reading it). Explain that asking and answering questions helps the reader to understand the text. Explain that some questions are quick to answer because the answers are in the text. Explain that some questions do not have answers in the text and require the reader to do some thinking. These types of questions do not always have one right answer. Show the cover of the book to the class and read the title. Have each student talk with a predetermined partner. Have each student ask their partner one question that can be answered by looking at the cover. Use the following frame: “I wonder…” (e.g., I wonder who the illustrator is?) Prompt them to use a question word from the chart. Have several students ask the class their “quick” questions. Let the students answer the questions by looking at the cover. Read chunk 1 to the class. At the end of the chunk have each student talk to the same partner. Have each student ask their partner a “quick” question for that chunk. Have several students ask the class their questions. Have the class answer the questions. Re-read chunk 1 if needed. Repeat with chunks 2 and 3. Print the following question on the chalkboard: Do you think that a hundred million moths will come and eat up the Toronto Maple Leafs sweater? Have each student turn to the same partner to talk about the question. Reflect on the fact that the question generated a lot of discussion and thinking. Help the students to understand the difference between this “thinking” question and the “quick” questions that were generated earlier. Congratulate everyone on their questioning skills.